CheckAdvantage offers an assortment of manual business checks that are the perfect fit for all sorts of businesses - both big and small! 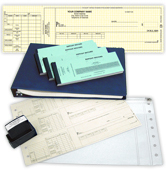 Our high quality, highly secure checking products come in the most popular styles. 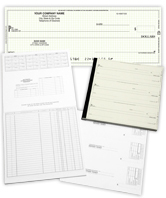 You'll find a variety of 3-On-A-Page manual styles, including checks with vouchers. For the business professional who's always on the move, we offer Desktop Checks with register, deposit slips and a cover. You can even get a refill on all three items without ordering a new cover. 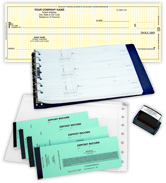 There's also complete Business Check Kits, which are an ideal way to help your company get off on the right foot financially. 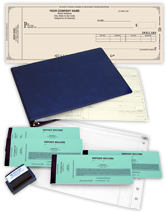 Kits come equipped with a 7-Ring Check Binder, 200 Deposit Slips, a Pre-Inked Endorsement Stamp and Checkbook Organizer. 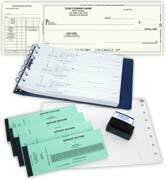 Manual business checks from CheckAdvantage are produced quickly and efficiently. There's no need to be concerned about them being compatible with your bank. All CheckAdvantage products are guaranteed to work at the vast majority of financial institutions. If you do have issues - we'll pay to fix the problem! 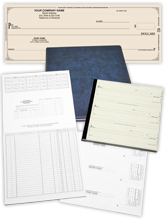 Your new business checks are also guaranteed to be secure. Numerous Security Features come standard with all our business products. Orders typically leave our warehouse within 3 business days. If you need your checks faster, we also offer In-Plant Rush. Get everything you could ask for in manual business checks when you order online from CheckAdvantage today!